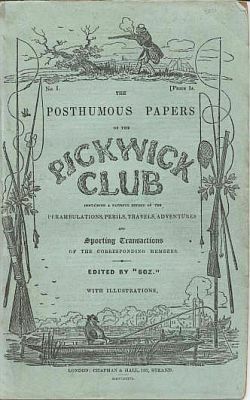 The Posthumous Papers of the Pickwick Club (better known as The Pickwick Papers) was the first novel by Charles Dickens. It was published in 1836-1837 as a serial in 20 parts with the final two parts published together. The Pickwick Papers is a sequence of loosely-related adventures. The novel's main character, Mr. Samuel Pickwick, Esquire, is a kind and wealthy old gentleman, and the founder and perpetual president of the Pickwick Club.